An occupational license means that it is against the law for a potential worker to carry out a certain job without obtaining a licence. The basic tradeoff of occupational licensing is fairly well-understood: Does occupational licensing as actually implemented offer improved quality of service for consumers in a way that makes it worth a higher price for consumers and a higher wage for those who have the licenses? As one might suspect, the answer to this question is "it depends." In particular, it depends on how much the rules for obtaining a license actually improve quality, and how much the rules limit potential competition. "Occupational Licensing: A Framework for Policymakers," a July 2015 report from the US Department of the Treasury Office of Economic Policy, the Council of Economic Advisers, and the US Department of Labor, explores the issues. 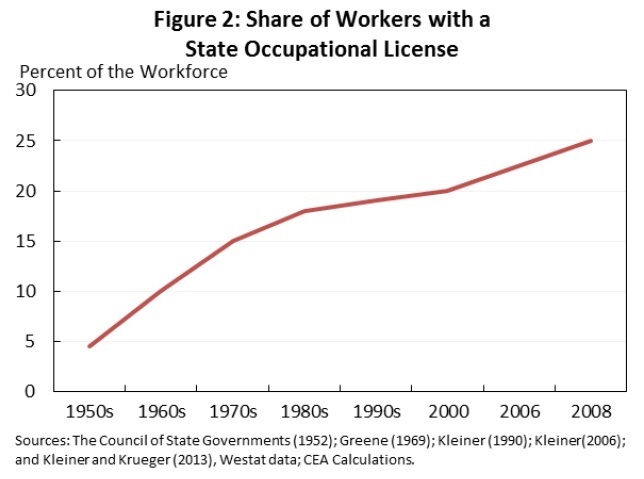 Occupational licenses are a bigger issue than often recognized, because they are a growing share of the workforce, now at about one in four workers. Estimates find that unlicensed workers earn 10 to 15 percent lower wages than licensed workers with similar levels of education, training, and experience. ... Licensing laws also lead to higher prices for goods and services, with research showing effects on prices of between 3 and 16 percent. Moreover, in a number of other studies, licensing did not increase the quality of goods and services, suggesting that consumers are sometimes paying higher prices without getting improved goods or services. A common dynamic is that the licensed profession tries to pass rules so that those outside the profession cannot offer certain services. In one prominent recent case, the occupational licensing board for dentists in North Carolina, which is made up of dentists, argued that only licensed dentists can provide teeth-whitening services, That decision seemed to be less about the quality of teeth-whitening services for consumers, and more about trying to lock up provision of lucrative service for dentists. It's also generally true that it's harder for those with lower skill levels or incomes to bear the costs of obtaining an occupational license--even if some of what is required for the license doesn't seem all that closely related to doing quality work. Estimates suggest that over 1,100 occupations are regulated in at least one State, but fewer than 60 are regulated in all 50 States, showing substantial differences in which occupations States choose to regulate. For example, funeral attendants are licensed in nine States and florists are licensed in only one State. ... The share of licensed workers varies widely State-by-State, ranging from a low of 12 percent in South Carolina to a high of 33 percent in Iowa. Most of these State differences are due to State policies, not differences in occupation mix across States. ... States also have very different requirements for obtaining a license. For example, Michigan requires three years of education and training to become a licensed security guard, while most other States require only 11 days or less. South Dakota, Iowa, and Nebraska require 16 months of education to become a licensed cosmetologist, while New York and Massachusetts require less than 8 months. ... For example, while all States require manicurists to be licensed, some also require proof of English proficiency, and the required amount of training at a State-approved cosmetology school varies from 100 to 600 hours. Telework. Lots more work can be done long-distance, across state and of course also across national borders. 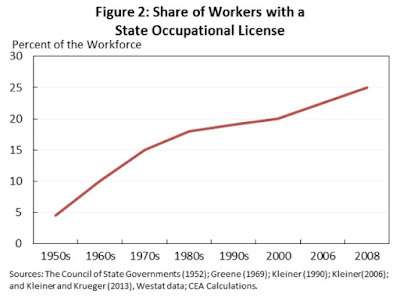 As a result, occupational licensing rules that vary across states are looking obsolete. The report notes: "Telework can enable more flexible scheduling and work locations, something that is important in helping workers with competing demands on their time stay in the labor force and maintain work-life balance. It has the potential to offer clients more continuous access to providers and access to more specialized providers, as well as increasing the pool of competing practitioners overall. ... Insurance companies often provide clients access to a nurse-staffed call center to answer minor medical questions. These nurses reside and practice near the call center location, but they may take calls and make over-the-phone diagnoses for clients across the country. ... Telehealth applications including hotlines and interactive web-based programs were used extensively following the September 11th, 2001 terrorist attacks on New York City and Washington, D.C., and during recent hurricanes. ... State licensure has proven to be a barrier to the growth and development of telework ..."
Distance learning. Students now take courses from institutions not in their state. Again, occupational licensing rules that vary dramatically across states end up looking obsolete. "In 2013, 11.3 percent of all U.S. undergraduate students (2.0 million students) were enrolled in institutions in which all instructional content was delivered through distance education, and more than one in four undergraduates took at least one distance education course (4.6 million students).70 Students can now take courses remotely from training providers in almost any State." Apparently there is a National Council for State Authorization Reciprocity Agreements--but with only 23 states participating. The Possibility of Online Rating. Many of us now look at online ratings when choosing a provider of a good or service. 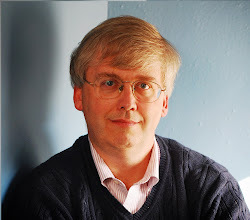 "In recent years, however, the growth of online consumer information and review websites has made it easier for consumers to find information on the quality of firms and practitioners, and some observers have argued that consumer protection regulation should be updated to reflect this new access to information." Online ratings are far from perfect, of course. But we are no longer in the world where you have to judge a potential plumber or electrician or manicurist by the size of their ad in the telephone yellow pages. Military spouses. There's always political support for steps that wouldn't cost money but would make the lives of families where one person is working in the military easier. "About 35 percent of military spouses in the labor force work in professions that require State licenses or certification, and they are ten times more likely to have moved across State lines in the last year than their civilian counterparts." Reintegrating those leaving prison back into the workplace. There's a lot of concern about high US incarceration rates, and thus about what will happen as prisoners are released. "Twenty-five States and the District of Columbia have no standards in place governing the relevance of conviction records of applicants for occupational licenses. In these States, a licensing board may deny a license to an applicant who has a criminal conviction, regardless of whether the conviction is relevant to the license sought, how recent it was, or whether there were any extenuating circumstances. In many States, employers and occupational licensing boards are also permitted to ask about and consider arrests that never led to a conviction in making their employment decision." Student loan defaults and licenses. "In 21 States, defaulting on student loan debt can result in the suspension or revocation of a worker’s occupational license." Obviously, encouraging people to repay their loans by taking away their ability to work seems likely to be counterproductive. Encouraging mobility across the economy. Geographical mobility is economically useful, as at least some workers can relocate to where jobs are more available. But geographical mobility has been declining in the US economy (see here and here), and the inability to move an occupational license in a different state seems to be one of the reasons. "There are clear benefits to mobility, both for workers, employers, and the economy at large, and limits to mobility are themselves a cause for concern. ... [S]ince many occupations are licensed at the State level, licensed practitioners typically have to acquire a new license when they move across States. This alone entails various procedural hurdles, such as paying fees, filling out administrative paperwork, and submitting an application and waiting for it to be processed. Moreover, since each State sets its own licensing requirements, these often vary across State lines, and licensed individuals seeking to move to another State often discover that they must meet new qualifications (such as education, experience, training, testing, etc.) if they want to continue working in their occupation. The resulting costs in both time and money can discourage people from moving or lead them to exit their occupation." Under the force of these various pressures, policy with regard to occupational licenses is evolving. There are more interstate compacts, in which state agree to honor licenses for certain occupations from other states. Colorado has set up an umbrella agency for looking at all occupational licensing laws in the state, which reviews all licensing rules for costs and benefits and offers recommendations to the legislature. It can be useful to require that the group overseeing the occupational licensing rules includes some people from outside the occupation being licensed--including representatives of those who use the good or service. It can also be useful to require that if the group that sets up an occupational licensing rule must also play a role in enforcing that rule. Occupational regulation was discussed by Adam Smith (1776 ) in the Wealth of Nations (Book I, Ch. 10, Part II), where he focuses on the ability of the crafts to lengthen apprenticeship programs and limit the number of apprentices per master, thus ensuring higher earnings for persons in these occupations. "The patrimony of a poor man lies in the strength and dexterity of his hands; and to hinder him from employing this strength and dexterity in what manner he thinks proper without injury to his neighbor, is a plain violation of this most sacred property. It is a manifest encroachment upon the just liberty both of the workman, and of those who might be disposed to employ him. As it hinders the one from working at what he thinks proper, so it hinders the others from employing whom they think proper. To judge whether he is fit to be employed, may surely be trusted to the discretion of the employers whose interest it so much concerns. The affected anxiety of the law-giver lest they should employ an improper person, is evidently as impertinent as it is oppressive. The institution of long apprenticeships can give no security that insufficient workmanship shall not frequently be exposed to public sale."